Steve F45 wrote: i had seen a lide on ebay of a maroonish NYSW boxcar that was more modern. It did not have friction bearings like some of the pics on railfan.net. Anyone know when NYSW stopped using its own rolling stock besides MOW stuff? The cars you are asking about were the 35 PS-1 boxcars used for express and LCL service that were built in 1952. In 1956, 25 of the cars were sold to the CIL (Monon) and became their numbers 541-565. The remaining 10 were probbaly old off gradully, but at least one survives in the URHS collection in the Yellow and Black scheme. I received a question on the Susie-Q boxcars and thought here might be the best place for an answer. The question is below. Any help would be appreciated. I recently picked up a Bachmann HO-scale 40' Box Car model decorated for NYS&W that includes the "Ship with Susie-Q" slogan and character on the car. My understanding is the slogan and Susie-Q character date to the early 1960s? And only a group of 25 box cars received the character and slogan scheme: 501-525 40-foot sliding door box cars. Can you shed any additional history on Susie-Q and her place in NYS&W history? I also noted the model includes a service date of "GW 8 64", which I assume means painted in August 1964, but what does "GW" mean? Initials for shops on the NYS&W? My understanding was that Susie Q was the result of a contest that was thought up by Irving Maidman. Not sure if it was employees or the children of employees but this was the concept that won. I think the winner got a small number of shares of NYS&W stock. At least once they held a "SusieQ" beauty contest with the winner dressing up like the image. njmidland, thanks for the info. Any idea what the "GW" by the date stands for? GW was the station call sign for Edgewater, NJ yards on the NYS&W. L&HR C&S wrote: GW was the station call sign for Edgewater, NJ yards on the NYS&W. Having seen this thread by chance a couple nights ago, and knowing that I was going to be in the general vicinity of Fairclough Fuel Oil in Paterson today, I brought my camera and thought I'd check and see if in fact that old Susie-Q box car was still sitting in their lot, as was mentioned above by L&HR C&S. I always liked these old cars. So, lo and behold, I drove by the lot today around 1:15, and there she was. The Susie Q art work has certainly seen better days, but it's certainly recognizable. Pretty cool. I just ran across this thread, and figured I'd add to it. The "old wood boxcar" at Butler, NJ mentioned earlier is actually a former GATX ice-refrigerator car. It was updated in the early-1950's when it's four roof ice hatches were removed and the car was fitted out for "top icing" (a process where icing crews pumped chipped ice on top of the perishable load thru the open doors of the car). The large reefer doors were also updated to the "plug-door" type. The car was acquired from GATX in the early-1970's for use on the Morris County Central RR in Whippany, NJ. When the MCC moved its operation to the NYS&W at Newfoundland, NJ at the end of 1973, the reefer was part of the consist. It eventually became home to the Pequannock Valley Transportation Musuem (a predecessor of today's Whippany Railway Museum) which had been set up at Newfoundland to operate in conjunction with the MCC steam trains. The reefer / museum car eventually became property of the Delaware Otsego System after the MCC went out of business at the end of 1980. It's been at Butler for many, many years now and is used by NYS&W construction crews. 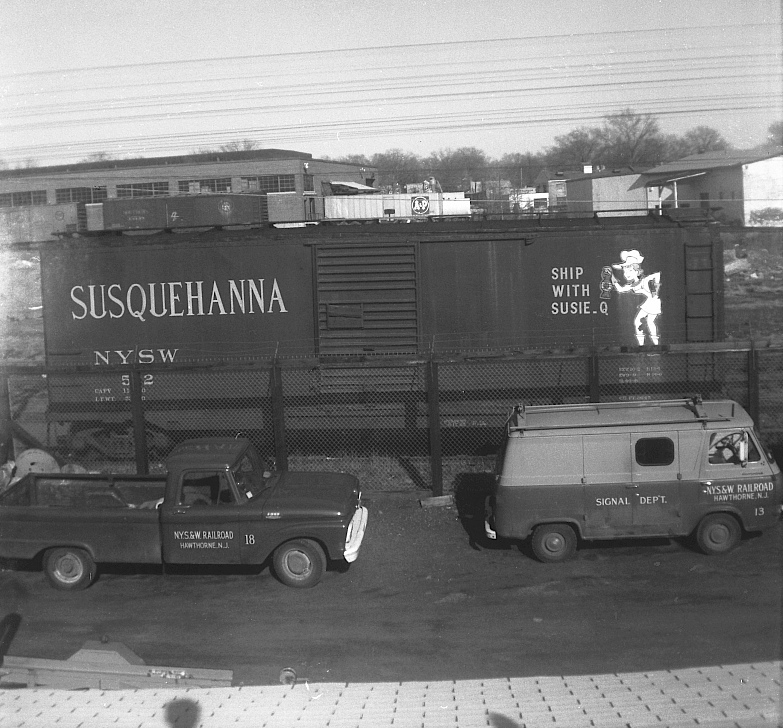 In 1979, the late, NYS&W Conductor John Treen loaned me an original Susie-Q decal... yes, they were water-applied decals that were on the steel Susquehanna boxcars ! I took the large (about 5 feet tall) decal home with me, and made a tracing of the original. I then used the tracing to mark out the artwork on the wood reefer. With the scribed wood sides, it was a lot of work to mark the lines, and then apply the paint. I returned the original decal to John Treen (I have no clue of its whereabouts today)...but I do have the tracing...someplace ! In 1980, Lionel Trains came out with an 'O' gauge boxcar lettered for NYS&W and featured the Susie-Q logo. We contacted them and received permission to use the Lionel number (9402) on our reefer, and the words "BLT. 1-1980 Lionel (R)" (just one of those things done as a bit of a lark). The Lionel wording is still there today, along with a very faded and peeling "Susie-Q". Two photos are attached showing me (a long time ago) in the process of painting the logo on the car...as well as a shot of the museum car after lettering. Gettin' to be a looong time ago now. In the 1990's the Whippany Railway Museum had an event that featured the NYS&W as its main theme. Of course we had to have a "Susie-Q" in attendance... attached is a photo of her. what happened to all the memorabilia that was at the museum? I don't want to go too far off topic, but I noticed that caboose is the same one that is in Pompton Lakes. Any idea when it was moved to Pompton? Great photos Whippany. If there is anymore that you could share I, that would be great.